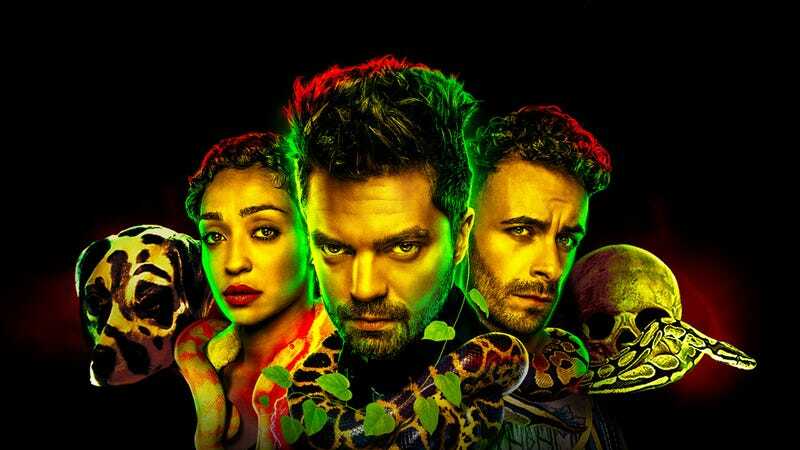 Ruth Negga, Dominic Cooper, and Joseph Gilgun will get one more season as Tulip, Jesse, and Cassidy. Executive producer Seth Rogen made the announcement on his Instagram. Here’s the post. Based on the cult comic classic by Garth Ennis and Steve Dillon, Preacher never achieved the mainstream popularity of AMC’s other comic book adaptation, The Walking Dead. The story of a preacher, his girlfriend, and a vampire on the search for God had its ebbs and flows (including a whole first season of set-up), but, by the end of its most recent season, the show had started truly embracing the batshit elements that made the comics so good. It had the Saint of Killers battling Satan, Hitler was running around, there were a bunch of vampires, God was a big part of it...overall, everything was starting to ramp up to true Preacher status. Now, with only one more season left, you can be sure executive producers Seth Rogen, Evan Goldberg, and showrunner Sam Catlin will do their best to bring the series to a satisfying conclusion, even if it means they won’t get to fully explore Ennis and Dillon’s work. The fourth and final season of Preacher begins August 4.